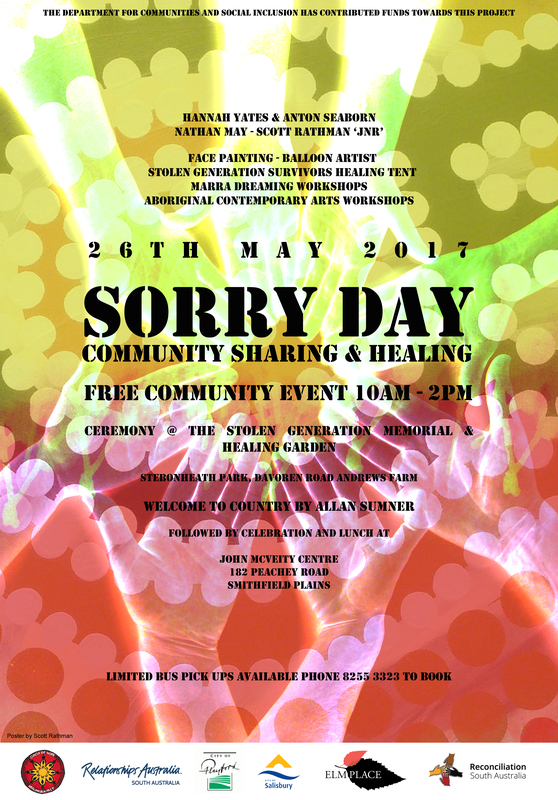 A community sharing and healing event will again be held at the Stolen Generation Memorial and Healing Garden at Stebonheath Park, Andrews Farm. The ceremony will be followed by a celebration and lunch at the John McVeity Centre, 182 Peachy Road, Smithfield Plains. The event at the Memorial and Healing Garden will begin with a Welcome to Country by Allan Sumner, and elders will lead a short walk towards the memorial. At this time, leaders from the community will speak and a ceremonial tree planting will take place. Festivities will continue at the John McVeity Centre, with music, activities for all ages and a free community BBQ. Marra Dreaming and Aboriginal Contemporary Arts workshops will be available on the day, with live entertainment from, Hannah Yates & Anton Seaborn, Nathan May and Scott Rathman Jnr. Limited bus pick-ups are available on the day, please phone 08 8255 3323 to book.